Clobert, J., Danchin, É., Dhondt, A. A. and Nichols, J. D. 2001. Dispersal. Oxford University Press, New York. De gauche à droite : Luc-Alain Giraldeau et Frank Cézilly. Danchin, É., Girladeau, L.-A. and Cézilly, F. 2008. Behavioural Ecology. Oxford University Press. Multi-author textbook with 20 chapters. Danchin, É., Heg, D. and Doligez, B. 2001. Public information and breeding habitat selection. Chapter 17. In Dispersal (Clobert, J., Danchin, E., Dhondt, A. A. and Nichols, J. D. eds) : 243- 258. Oxford University Press, Oxford. Ronce, O. Clobert, J., Olivieri, I. and Danchin, É. 2001. Perspectives for the study of dispersal evolution. Chapter 24. In Dispersal. (Clobert, J., Danchin, E., Dhondt, A. A. and Nichols, J. D. eds) : 340-357. Oxford University Press, Oxford.Danchin, É., Cézilly, F. and Giraldeau, L-A . 2008. 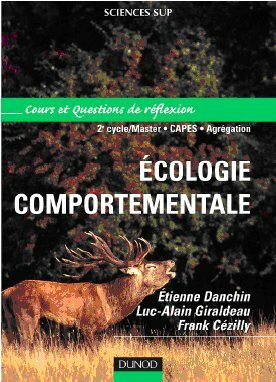 Fundamental Concepts in Behavioural Ecology. In : Behavioural Ecology, Danchin, É., Girladeau, L.-A. and Cézilly, F. (eds), pp. 55-53. Oxford University Press, Oxford. Cézilly, F., Danchin, É. and Giraldeau, L.-A. 2008. Testing Hypotheses in Behavioural Ecology. In : Behavioural Ecology, Danchin, É., Girladeau, L.-A. and Cézilly, F. (eds), pp. 55-95. Oxford University Press, Oxford. Danchin, É. and Wagner, R. H. 2008. An information driven approach to behaviour. In : Behavioural Ecology. Danchin, É., Girladeau, L.-A. and Cézilly, F. (eds), pp. 97-131. Oxford University Press, Oxford. Dufty A. M. and Danchin, É. 2008. Hormones and behaviour. In : Behavioural Ecology, Danchin, É., Girladeau, L.-A. and Cézilly, F. (eds), pp.185-228. Oxford University Press, Oxford. Boulinier, T., Mariette, M., Doligez, B. and Danchin, É. 2008. Choosing Where to Reproduce – Breeding Habitat Selection. In : Behavioural Ecology, Danchin, É., Girladeau, L.-A. and Cézilly, F. (eds), pp. 285-321. Oxford University Press, Oxford. Clobert, J., de Fraipont, M. and Danchin, É. 2008. Evolution of Dispersal. In : Behavioural Ecology, Danchin, É., Girladeau, L.-A. and Cézilly, F. (eds), pp. 323-359. Oxford University Press, Oxford. Danchin, É. and Cézilly, F. 2008. Sexual Selection : Another Evolutionary Process . In : Behavioural Ecology, Danchin, É., Girladeau, L.-A. and Cézilly, F. (eds), pp. 363-426. Oxford University Press, Oxford. Cézilly, F. and Danchin, É. 2008. 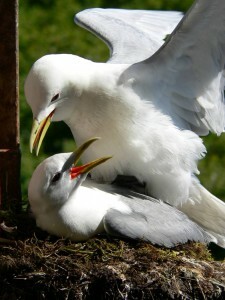 Mating Systems and Parental Care. In : Behavioural Ecology, Danchin, É., Girladeau, L.-A. and Cézilly, F. (eds), pp. 429-465. Oxford University Press, Oxford. Danchin, É. and Giraldeau, L.-A . 2008. Animal aggregattion : Hypotheses and Controversies. 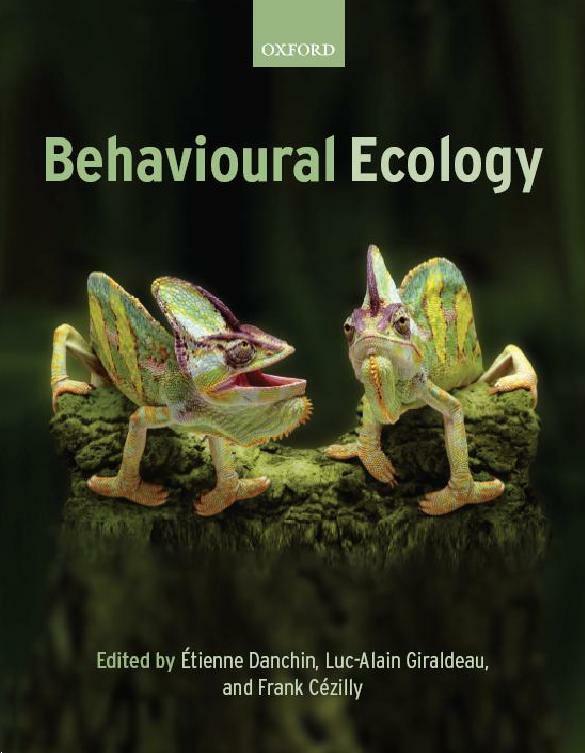 In : Behavioural Ecology, Danchin, É., Girladeau, L.-A. and Cézilly, F. (eds), pp. 503-545. Oxford University Press, Oxford. Møller, A. P. and Danchin, É. 2008. Behavioural Ecology and Conservation. 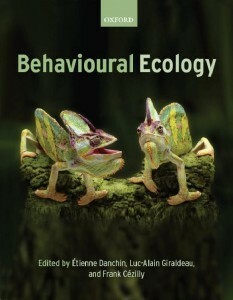 In : Behavioural Ecology, Danchin, É., Girladeau, L.-A. and Cézilly, F. (eds), pp. 647-664.. Oxford University Press, Oxford. Møller, A. P. and Danchin, É. 2008. The behavioural ecology of humans. In : Behavioural Ecology, Danchin, É., Girladeau, L.-A. and Cézilly, F. (eds), pp. 667-691. Oxford University Press, Oxford. Danchin, É. and Wagner, R. H . 2008. Cultural evolution. In : Behavioural Ecology, Danchin, É., Girladeau, L.-A. and Cézilly, F. (eds), pp. 693-726. Oxford University Press, Oxford.